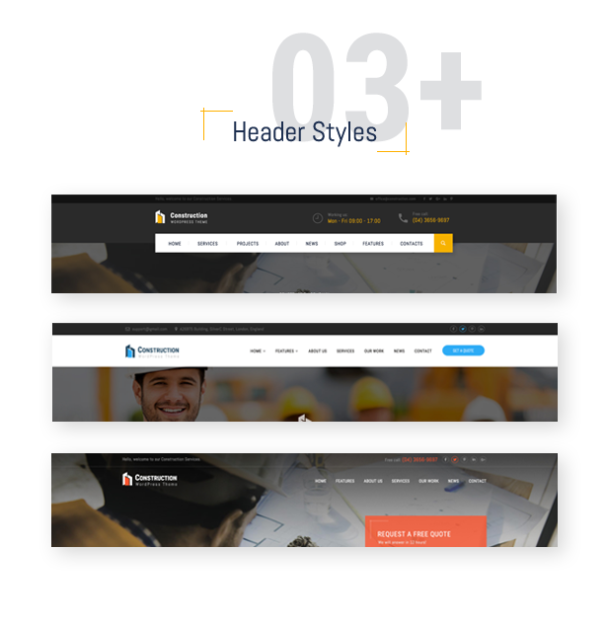 Construction HTML Template MegaBuilder is a professional corporate HTML template for construction, interior design, industrial design, engineering, architecture design, building renovation, renovate, factory or manufacturing companies, etc. MegaBuilder helps you create an awesome looking & highly functional website with a strong impression of professional, trust and innovation just like your company. WordPress version of Mega Builder Template is available here This construction template is multipurpose for all industries so even if you are working in some other fields like landscaping, plumber, mechanic, electrician, firefighter, repairer, carpenter, painter, …, it would still help you create a powerful, beautiful and modern website for your business in just a few minutes. The Multi-Purpose Construction HTML Template made ONLY FOR YOU. Built by the best SEO experts, MegaBuilder is super-fast → People can find you easier on Google → More Potential Clients. Your company’s contact detail (email, mobile phone) and attractive Call To Action buttons are put all over the site → Get clients to contact & hire you easier. Launch your business construction website at ease, in no time. The first step in helping you create an online website for your business is to provide a lot of stunning, unique pre-design layouts and theme elements, so you only need to install and choose what theme demo you like for your interior design/industrial/engineering corporate. This way, you don’t have to lose any time to “reinvent the wheel” because we already built the whole system for you. Unlike other Multi-Purpose, Multi-Niche template which are used for many niches but have no special focus, MegaBuilder is the multipurpose HTML template made only for construction, building interior design, architecture, and industrial sector. Therefore, it has all the needed elements for a construction engineering business to prosper. The theme’s layouts and features are arranged logically to make sure it would win your client’s heart and win more profitable deals, more contracts for you. 1. Revolution Slider to slide show and animate your company’s core values. This will eliminate any barrier and let anyone buy your products easier. 3. Service Page: Display your service and persuade your customer at ease. We use a special service page system to display your range of services where you can add your sales pitch, include real photos and brochures to convince your clients. We understand this, and we custom made a portfolio section with many different designs for you to choose from. We understand that you have many services and therefore, you will need different pricing options. A clean, sleek Pricing Table will do this job very well. To get more customer, we purposely use a combination of Contact Info (Email, Address, Mobile Phone) and Get a quote CTA all around the site. There is even a few box asking for customers emails so you can catch up with them later and convert them into sales. Almost everybody has an iPhone. Most of your users will visit from mobile phones. We want all of your visitors to have the best experience possible (so they will be more likely to become your client). Therefore, the theme is responsive and mobile friendly. Just grab your iPhone and see how beautiful the site is on Mobile. Get help by the A-star After-sale support team. Apart from writing perfect, flawless codes, we also write details step by step tutorials on how to use the theme. If you are just getting started and you are new to web design, it will be extremely helpful. If you are an experienced freelancer or web developer, it will also be very helpful to build a website for your client. Read documentation here.